We’ll provide some insights and review some of our DFS value players for week 9. 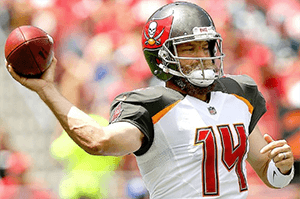 Ryan Fitzpatrick (TB) – Salaries: DraftKings (DK) – 5500, FanDuel (FD) – 7100. 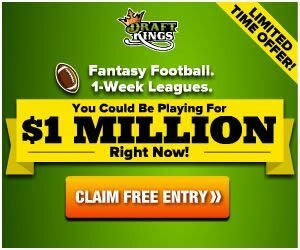 Fitzpatrick’s upcoming salary ranks him 16th/19th on DK/FD, respectively for the position. Fitzpatrick posted an 11/15, 194, 2:0 line and 1-18-0 on the ground at Cincinnati last week. Fitzpatrick’s fantasy points of 19.56 ranked him 15th/14th on DK/FD, respectively. Of note, Fitzpatrick’s production came on only 17 minutes of play, as he entered the game at the end of the 3rd quarter to relieve a benched Jameis Winston. The betting line with the Panthers lists the game total at 54.5 points (3rd highest on the board) with the Bucs as +6.5 point road dogs. The Bucs’ implied team total is currently at 24 points and the Panthers are currently at 30.5 points. The Panthers rank 16th against QBs in fantasy points allowed and 20th in DVOA against the pass. Carolina’s defense has allowed 2+ passing TDs in six straight games. Joe Flacco put up a 22/39, 192, 1:2 line and 2-14-0 on the ground and Lamar Jackson logged a 4/5, 46, 1:0 line and 3-26-0 on the ground against the Panthers last week. Todd Monken’s offense rank 1st in pass yards per game and 7th in points per game with 376.3 and 28.7, respectively. The Bucs’ pass yards/gm is over 56 yards more than 2nd ranked Pittsburgh. Despite playing in just about 15 quarters this season, Fitzpatrick’s 13 pass TDs ranks 15th, tied with Aaron Rodgers, Carson Wentz, and Cam Newton. Among active starters, Fitzpatrick’s avg. intended air yards of 10.9 and avg. completed air yards of 10.3 both rank 1st. He’s the only QB to have surpassed double-digits in both categories. His .83 fantasy points per attempt also ranks 1st. In his three full starts, Fitzpatrick hasn’t thrown for less than 402 passing yards. Carolina’s run-defense ranks 8th in rush yards allowed and 7th in DVOA against the run, plus as 6.5 point favorites, this game sets up well for a FitzMagic aerial assault. FitzMagic is back, and there’s a decent chance he’s back for good. Winston’s contract is only guaranteed next year for injury, leaving Tampa Bay with a financial incentive to NOT play him. Winston may be done in Tampa Bay, and if so, FitzMagic shouldn’t be on a leash, unless FitzTragic strikes in a major way. Jared Goff (LAR) – Salaries: DraftKings (DK) – 6000, FanDuel (FD) – 8400. Goff’s upcoming salary ranks him 8th/5th on DK/FD, respectively for the position. Goff posted a 19/35, 295, 3:0 line and 5-7-0 on the ground against Green Bay last week. Goff’s fantasy points of 26.5 ranked him 5th on both DK/FD for the position. Goff’s price per point efficiency ranked him 6th/8th on DK/FD, respectively. The betting line with the Saints lists the game total at 60 points (highest on the board) with the Rams as +1.5 point road dogs. The Rams’ implied team total is currently at 29.25 points and the Saints are currently at 30.75 points. The Saints’ defense ranks 30th against QBs in fantasy points allowed, last against WRs in fantasy points allowed, and 29th in DVOA against the pass. The Saints also rank 28th in pass yards allowed per game with 300 and 23rd in points allowed with 26.1/gm. Kirk Cousins put up a 31/41, 359, 2:1 line against New Orleans last week. The Rams rank 3rd in scoring with 33 points/gm and Goff ranks 3rd (tied) in passing TDs with 17. This should be the main-slate game of the week. Players on both sides should be popular plays this week, Goff included. Aaron Jones (GB) – Salaries: DraftKings (DK) – 4400, FanDuel (FD) – 5800. Jones’ upcoming salary ranks him 30th/30th on DK/FD, respectively. Jones posted a 12-86-1 rush line and 2-0-0 on 2 targets at Los Angeles Rams last week. Jones’ fantasy points of 16.6/15.6 ranked him 17th/16th on DK/FD, respectively for the position. The betting line with the Patriots has the game total at 57 points (2nd highest on the board) with the Packers as +5.5 point road dogs. The Packers’ implied team total is currently at 25.75 points and the Patriots are currently at 31.25 points. The Pats rank 17th against RBs in fantasy points allowed and 9th in DVOA against the run. The Bills’ RBs combined for an 18-47-0 line and 8-93-0 on 11 targets against the Pats last week. Ty Montgomery was traded to Baltimore. After disobeying coach’s orders and running a kickoff out of the end zone, only to fumble it away, denying Aaron Rodgers a shot at a game winning drive, Montgomery’s fate was sealed. Montgomery had a 30.8% snap share, 19.5% carry share, and a 7.8% target share on the season, but his volume was dwindling. Jones out-snapped Jamaal Williams 32 to 13 and out-touched Williams 14 to 4 last week. Montgomery had 6 snaps and 3 touches. It would seem Jones has finally emerged as the lead dog, ending this nonsensical committee scenario. Jones’ volume should only increase from this point forward, regardless of game script. Nick Chubb (CLE) – Salaries: DraftKings (DK) – 4500, FanDuel (FD) – 6600. Chubb’s upcoming salary ranks him 29th/17th on DK/FD, respectively for the position. Chubb posted an 18-65-0 rush line and 2-10-0 on 3 targets at Pittsburgh last week. The betting line with the Chiefs has the game total at 51 points with the Browns as +8.5 point home dogs. The Browns’ implied team total is currently at 21.25 points and the Chiefs are currently at 29.75 points. The Chiefs rank 31st against RBs in fantasy points allowed and last in DVOA against the run. The Broncos’ RBs combined for a 27-173-1 rush line and 7-40-0 on 7 targets at Kansas City last week. With the long overdue overhaul of the coaching staff, Gregg Williams and Freddie Kitchens find themselves in new roles. The implied negative script is a concern for Chubb, but it would not be surprising for the new staff to give Chubb as much run as possible, even if the negative script does hold. And it will. The logical play in this scenario would be to keep the Chiefs’ potent offense off the field as much as possible. Despite the game script, the matchup is great for Chubb and he is cheap. Latavius Murray (MIN) – Salaries: DraftKings (DK) – 5100, FanDuel (FD) – 6700. Murray’s upcoming salary ranks him 20th/15th on DK/FD, respectively. Murray posted a 13-56-1 rush line and 5-39-0 on 6 targets against New Orleans last week. Murray’s fantasy points of 20.5/18 ranked him 12th/13th on DK/FD, respectively for the position. The betting line with the Lions has the game total at 49 points with the Vikings as -4.5 point home favorites. The Vikings’ implied team total is currently at 26.75 points and the Lions are currently at 22.25 points. The Lions rank 27th against RBs in fantasy points allowed, 30th in DVOA against the run, and 31st in rushing yards allowed with 144.6/gm. The Seahawks’ RBs combined for a 37-139-1 rush line and 3-21-0 on 3 targets against the Lions last week. The implied positive game script at home is setting up as a Murray type of game. Murray’s 5 catches last week ties his season high. The Lions also rank 22nd in DVOA against RBs in the pass, so this matchup overall does work favorably for the workhorse back. Courtland Sutton (DEN) – Salaries: DraftKings (DK) – 3900, FanDuel (FD) – 5500. Smith’s upcoming salary ranks him 60th/44th on DK/FD, respectively for the position. Sutton posted a 3-78-0 line on 4 targets at Kansas City last week. The betting line with the Texans lists the game total at 46 with the Broncos as -1 point home favorites. The Broncos’ implied team total is currently at 23. 5 points and the Texans are currently at 22.5 points. The Texans’ defense ranks 11th against WRs in fantasy points allowed and 14th in DVOA against the pass. The Dolphins’ WRs combined for a 15-213-0 line on 23 targets against the Texans last week. With the trade of Demaryius Thomas to Houston, Sutton stands to benefit the most from this move. This may actually be an addition by subtraction situation for Denver, as Sutton has been the more effective player. Thomas’ snap rate of 74.6%, 56 targets, 36 catches, and 402 receiving yards all rank 2nd on his former team. Thomas also led the Broncos in red zone targets and catches with 8 and 7, respectively. Thomas’ 7 targets/gm and 4.5 catches/gm should swing towards Sutton as he now becomes a full-time WR2. Marvin Jones Jr. (DET) – Salaries: DraftKings (DK) – 5300, FanDuel (FD) – 6500. Jones’ upcoming salary ranks him 25th/23rd on DK/FD, respectively for the position. Jones posted a 7-117-2 line on 10 targets with a 97% snap rate against Seattle last week. Kenny Golladay (DET) – Salaries: DraftKings (DK) – 5500, FanDuel (FD) – 5700. Golladay’s upcoming salary ranks him 23rd/30th on DK/FD, respectively for the position. Golladay posted a 1-12-1 line on 1 target with a 92% snap rate against Seattle last week. The betting line with the Vikings has the game total at 49 points with the Lions as +4.5 point road dogs. The Vikings’ implied team total is currently at 26.75 points and the Lions are currently at 22.25 points. The Vikings rank 3rd against WRs in fantasy points allowed, 16th in DVOA against the pass, and 15th in passing yards allowed with 244.6/gm. Golden Tate has been traded to the Eagles. Tate’s 69 targets, 44 catches, and 517 receiving yards were all team highs for Detroit. Tate leaves a massive 26.6% target share available. Brandon Powell is the supposed heir to the slot, but he hasn’t taken a snap yet this season. Detroit ran a high percentage of 11 personnel, but with the departure of Tate, they could shift more towards 12 personnel, leaving the Lions’ share of Tate’s volume to Jones and Babytron. Pun not intended, but I’m actually good with it. RB Theo Riddick (knee) is expected back this week and should immediately resume his passing-down role. This is probably more of a hit against Kerryon Johnson. Austin Hooper (ATL) – Salaries: DraftKings (DK) – 3800, FanDuel (FD) – 5900. Hooper’s upcoming salary ranks him 11th/8th on DK/FD, respectively for the position. Hooper posted a 3-48-0 line on 4 targets against the Giants in week 7. The betting line with the Redskins has the game total at 47 points with the Falcons as +1.5 point road dogs. The Falcons’ implied team total is currently at 22.75 points and the Redskins are currently at 24.25 points. The Falcons are coming off their bye. The Redskins’ defense ranks 15th against TEs in fantasy points allowed and 12th in DVOA against TEs. Evan Engram put up a 4-25-1 line on 9 targets against Washington last week. Hooper’s 41 targets and 33 receptions are 2nd on the team, behind only Julio Jones. Hooper’s 82.5% snap rate leads the team for all skill positions. Hooper’s production this season has been somewhat volatile, but with the current state at the TE position, it is what it is. OJ Howard (TB) – Salaries: DraftKings (DK) – 4300, FanDuel (FD) – 6000. Howard’s upcoming salary ranks him 10th/7th on DK/FD, respectively for the position. Howard posted a 4-68-1 line on 4 targets at Cincinnati last week. Howard’s fantasy points of 16.8/14.8 ranked him 5th on both DK/FD for the position. Howard’s price per point efficiency ranked him 6th/4th on DK/FD, respectively. The Panthers’ defense ranks last against TEs in fantasy points allowed and 28th in DVOA against TEs. The Ravens’ TEs combined for a 7-67-1 line on 11 targets against the Panthers last week. Howard’s TD last week came in the 4th quarter from Ryan Fitzpatrick. Howard is a Fitzpatrick favored target, and with him back under center, as opposed to Winston, his stock moves up. Howard makes for a solid stacking option with FitzMagic.